If you’re like us you may have read an article showcasing a particular car or saw something fly by the opposite direction and thought to yourself, “I’d like to get my hands on one of those.” So you jump online and start searching the used market only to find that every one that’s for sale is either on the opposite side of the country, clapped out, stanced or modified beyond hope of returning to factory form. This happens to me quite often. So much in fact that I’ve decided to share a handful of cars, in no particular order, which are impossible to find stock or in original-ish form. The Mazda RX-7 had low production numbers from the get go. Reliability of the wankel engine wasn’t stellar. I’m pretty sure the only FD RX-7’s with original non-rebuilt engines are those in Mazda’s museum. The aftermarket and enthusiast communities quickly started to dissect the failures and came up with a list of “reliability mods”. If you see an RX-7 on the road, it will undoubtedly have one or more of these reliability mods — or a Chevrolet V8. Perhaps the worst of this list. Because it’s RWD and resale is so low these cars have been snagged up from every old lady possible to convert in to race drift cars. In the event you even spot a 240SX on the street, there’s a 50% chance it has an engine swap. With 170 horsepower and a 8,000 RPM redline, these cars offered big fun right off the showroom floor. Aftermarket support for these cars reached record levels in the early 2000’s and these engines could be built to put over 200 horsepower to the ground. 3rd gear VTEC, anybody! No other naturally aspirated four cylinder was capable of running with them V8’s like Honda’s B18C series powered cars. 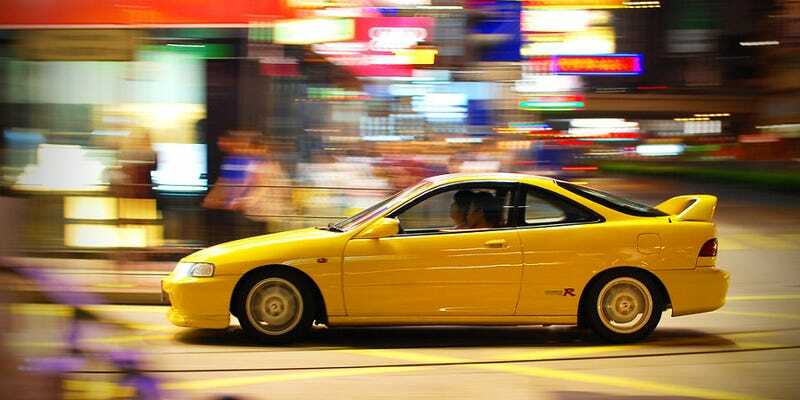 And then there was the Integra Type-R. Just over three thousand of Honda’s Acura Integra Type-R made it to the United States and since 1997 no car in history has had higher chances of being stolen. The cars were quickly stripped and the Type-R specific parts were sold in a jiffy. What was that saying? Ain’t a tight car if it ain’t a Type-R. If you were a fan of manual transmission, all wheel drive turbo cars with pedigree then you had two options: Subaru STi or Mitsubishi Evo. This was much like a small scale Ford v Chevy war. These are performance cars for the performance minded owners. Adding big power was cheap. Everybody knows the Agent O’Connor’s orange Supra from The Fast and The Furious franchise. With a few overnight parts from Japan, this car will decimate all. And it did. And everyone else followed suit. Momma always said, “Life was like a box of chocolates. You never know what you’re gonna get”. That is exactly how we describe any 5.0L Mustangs built up to the mid 90s. I don’t think I’ve seen a factory stock FOX body V8 since I quit my job at Ford in 2003. Have something to add to the list? Leave a comment below and tell us WHY your car deserves a spot on this list.